On most Internet forums, it is frowned upon to ‘bump’, ‘resurrect’, ‘necropost’, etc., that is to post in a thread that has been idle for a reasonably long time. On many forums this is a bannable offence. And some forums implement automatic systems that lock any thread after a set period of inactivity. Instead of ‘necroposting’, if the user thinks that a particular topic discussed in an inactive thread is worthy of further attention, they are expected to start a new thread, linking to the inactive one if applicable. What is the reason for such policy to be imposed? To be honest, I can’t see any benefit in prohibiting ‘necroposting’. 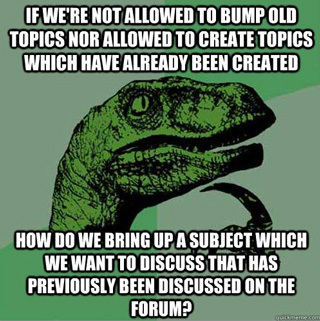 I’ve seen at least one forum that does the opposite: they like to stick to the rule of one forum thread per any possible discussion subject, and it is there a bannable offence not to ‘necropost’ and to start a new thread on a subject that has already been discussed there. I can’t help but it seems to me that this latter policy can help better to reduce mess and keep tidiness. A necropost is a message that revives (as in necromancy) an arbitrarily old thread, causing it to appear above newer and more active threads. This practice is generally seen as a breach of etiquette on most forums. Because old threads are not usually locked from further posting, necroposting is common for newer users and in cases where the date of previous posts is not apparent. The post was started by a user that asked for specific help and already resolved the issue. The post was started by a user that asked for specific help and is unresolved. Although there is no resolution the post is old enough (there seems to be a one month rule) that the original poster won't need the help anymore. The subject is not relevant anymore. For example, the topic is outdated. All these might seem quite subjective, but I guess the spirit of the users from the site might affect its rules and the way they are handled. But the main point is that some users (an enough relevant number) just continue posting in those posts without any value. What makes the difference between a common-style forum and a Q&A site is the distinction between answers and comments. Without this difference the post can become unmanegable. The reader has no efficient way to differentiate between useful/not-useful information. In Stack Exchange sites the importance and relevance is represented in answers and comments (comments sometimes can end up in discussions that go away from the main topic). So topics can get complex enough that it might be a good idea to ban posting on old posts without adding any value. Some forums ban any necroposting, some are more flexible, some permit opening new posts about already discussed topics... it probably depends on the value the users provide as a whole. Edit: Some thought on the UX part. As posts are primarly ordered by recent activity, it can be annoying (irelevant contributions make a post come to the top) when there are no levels (answers vs comments) of contributions. In Stack Exchange only when new questions, new answers, or modifications to any of the two are made, the "post" is brought to the top. Also the rating part of the system helps bringing valuable answers but also discarding un-valuable ones. This is probably the reason (Im guessing here) why comments can not be downvoted (there is no need to). One possibility: Spam. In the case of blogs, at least, I have found that monitoring comments on old posts for spam can be quite a task when the blog goes back several years. The universe of possible spam targets is reduced significantly if a time frame is set for comment cut-off. A lot of it is a UI problem with how phpBB-style forums present information. The pattern you'll tend to get is someone new will read through a bunch of old threads, and leave their two cents on each of them, filling up the thread lists with ancient threads. It shifts focus away from new posts. Most old posts have been abandoned. Most threads are from new users, mostly with a specific question. That question is then either answered, or it's not answered and some time goes by and the user abandons the question. Many "bumping" posts are answers to questions that have either already been answered or have been abandoned. If the OP hasn't visited the forum in a year, why spend time answering it? Why make other people spend time reading your post? It makes old threads harder to read. Let's say a thread starts, then is abandoned for a year, then you make a post, some discussion ensues, and then another year goes by. Now I as a reader stumble across the thread. The actual answer that was originally in the thread is now somewhere in the middle of the discussion instead of at the bottom. I now have to figure out when each post was made, when the answer was posted, what happened after that, etc. It would be much better for me if this had been split into two separate threads. This can trigger discussions on abandoned threads. Another thing I see very often is that one "bumping" post will cause the thread to rise to the top, which will cause other users to jump in, not realizing that the OP is long gone, and continue a discussion that has long since been abandoned. This creates a bit of a snowball effect as more active users spend time in that thread instead of on actual new conversations. This might not be an issue if the discussion is actually interesting, but most of the time it's not. Most bumping posts are low quality. Maybe your bumping post really does add something interesting, and maybe it does spark an interesting conversation. But 95% of the time it's a drive-by hit from a Google search, either offering a solution to an old problem (see above) or saying "thanks me too!" (notice that Stack Overflow disallows posts like this) or saying "I have the same problem, did you ever fix this?" Those types of posts might be useful to you as a poster, but they aren't useful to the forum as a whole, and they especially aren't useful to power users who are policing the forum. It's hard to decide whether you're an exception to the rule. Considering that 95% of bumping posts are low quality, it can be "hard" or time-consuming to take the time to read your post and the thread you've bumped to decide whether your post belongs there or not, then to reply to you asking you to start your own thread, or to lock the thread, or to take whatever action is now required of us. Most necromancing posts belong in their own thread. If you think that your post would be useful, maybe because you're having a similar problem and the posted solutions didn't work for you, then your post belongs in a new thread. Instead of continuing the old discussion, start a new discussion and link to the old one. This avoids all of the problems above, but allows you to ask follow-up questions or start a new discussion. Our time is free, but it's not worthless. Keep in mind that you aren't just talking to the OP. You're talking to everybody on the forum, particularly "power users" who sort by date. They're all going to read your post. They're probably going to re-read the entire thread. That might not seem like a lot of work, but keep in mind that many of these users are also moderating the forum, deleting spam (so much spam), banning rude users, answering questions, etc. We do this for free, in our spare time. You might think "what's the big deal if I make you spend a few minutes re-reading a thread", but moderating a forum is a zero-sum game. I only have a certain amount of time to do all this stuff. The more time you make me spend on old threads is less time I can spend banning spammers. So the more time you take away from us by bumping old threads, the less time we have to actually do our "jobs" on the forum. Especially because the fix is easy. Just post a new thread with a link to the old one. I know that some (or maybe all) of these issues can be addressed with different forum software. I really like Discourse, although it suffers from some of the same issues. And I know there are exceptions to all of the above. But if you're asking why forums (specifically the power users on those forums) frown on bumping old threads, these are some of the reasons why. While there is often plenty of value to add to old threads, and the onus is on the owners to properly archive these anyway, there are older posters and watchers to be notified. A lot of email bouncing. This adds to their workload. Yes they might bubble to the top, and maybe they should have always been a "sticky". Why it is useful : because solutions take years to appear, even for open source, and a classic example is dd progress in Linux. For years a pipeview (pv) solution was a workaround, but now there is a switch. Sadly the old posts saturate searches. For serious crimes, late information is better than none, nobody begrudges truly useful information. reddit is one specific case that operates a bit differently than most other forums. There, threads are ranked by "hotness, which takes into account votes on the post and the time it was posted. As a thread ages, its hotness decreases, and the frontpage is in fact cut off at 24 hours. This is all part of designing a system that shows new content, rather than keeping the same stuff visible as more and more people find it (and upvote it). Consequently, posting in a thread doesn't resurrect it. In fact, if you post in an old thread, there's a very good chance no one will ever see your comment. This leads to a general community recommendation to post a new thread instead with a link back to the previous discussion, as that new thread will get eyes on it that the old one won't. Locking a thread automatically after a few months helps prevent new users to the site from making this mistake, and wondering why no one ever replied to them. It also enables certain performance optimizations by ensuring the thread won't change. We know that StackExchange discourages extensive discussions. This is not the case in some forums. Sometimes people don't even care too much about solving the problem itself, but only the new things they have found or their inspirations from the topic. One could say they're more like chat rooms, but organized better. On some forums, as you have said, they make one thread per discussion subject, and users could watch only the subjects they are interested in. On other forums, users are supposed to read most of the threads, and many ideas from different threads could be linked together. They are both called forums and both have something called threads, but they are quite different. The threads of the first type are more like subforums of the second type. Of the first type, threads simply work like chat rooms that update slowly. Of the second type, they are not satisfied by the simple organization of each "thread", so they renamed them to subforums and divided each of them to more threads. In fact, I have seen forums that have dedicated chat room threads (for something that doesn't work well in the new way) that are supposedly exempted from this rule. Still, many of the discussions in the new way don't make much sense without context. In other places they may decide even dividing things by threads isn't enough, and use votes or tree structures. In a thread of the second type, things that isn't directly related to the topic could be outdated because nobody is interested in its context anymore, or someone posted a dedicated thread, or what is in question there has became well known latter, and a lot of other reasons that are unlikely to be explained in the post. As the conclusions aren't answering some concrete questions, and the questions could be from threads with not too much relevance, nobody likes to update every post that have mentioned this matter. And that isn't meant to be a small part. A post could be filled with all kind of these things. If there isn't a rule to ban reviving them, people may want to take efforts to repeat the points that everybody already know. The worse thing is that it could give an impression that most users assumed something being right, if they are allowed posting something against that but they don't, while the fact is those things are extensive (ie. irrelevant) discussions that nobody has specifically devised they became worth discussions again. If a forum really worked this way (not all forums do), instead of reviving old posts, they are likely very tolerant to reposting the same topic if the original thread is old. In this way they could clear out the obsolete things and things where the context is already gone, without damaging the records of the original discussions. Someone could ask only about the things they care currently, and everyone doesn't need to mention every perspective of the topic to make their ideas complete, which could make things too open-ended. On the other hand, if we compare it with StackExchange, most parts of the threads are like the suggestions in comments that are already incorporated in the answer. They could simply be deleted because they are outdated. But one couldn't do that easily on those kinds of forums, because they are extensive, and won't have a single conclusion. If there is a conclusion it's likely containing things in a single perspective. And people could prefer leaving things as is if it isn't worth more efforts for now to get a conclusion in their perspective. If it's formatted like StackExchange someone could theoretically invent a feature to archive the old discussions, preserving the thread, but it is much more easier to simply preserve the whole thing in the original form. In many cases forums are not used in this way. But I suppose many forum softwares are designed to work this way. As a result, proper tag or recommendation systems are relatively new things to them, because they are not required for the supposed forum model. In many cases you can only order the posts by last reply, and you don't have an idea about how it is likely solved or whether there are new informations before reading a thread. On StackExchange, we don't encourage making nonsensical edits to bump the posts, either. But if someone did that, it's just a minor annoyance. On a forum it could be much more disturbing. So they would emphasize on this rule even though it isn't appropriate anymore. Some people explain it by "if there is no reply, it simply means nobody knows". But IMO they are simply using the wrong model. If StackExchange worked better for their tasks, they should simply change to the StackExchange way. Or for the least, having proper tag and related post feature could mitigate the problem to some degree. On the more "traditional" forum that I knew, users are more likely being clear about the fact nobody knows, if they couldn't get a best solution in this situation, didn't tell them a better place to ask, and didn't even discriminate their requirement as being weird. And they have different problems. They could be annoyed by the fact many people went there from search engines, only wanted the answer to their questions and don't care about the extensive discussions, which worked best in their model but not Q/A sites. TL;DR: In a chatroom, you don't usually want to insert new things to old records, either. The "reason to discuss about something" isn't as trackable as concrete questions, and they get lost over time. Not the answer you're looking for? Browse other questions tagged rules-and-policies web-forums or ask your own question. Why do forums discourage necro-bumping? Should I intervene if my community acts contrary to its own policies? How to handle a user reposting a deleted message? Why use mailing lists instead of forums? Should I remove a user that broke our guidelines in one thread from being able to comment on it anymore?